The PCOP is integrally involved in educating and training the veterinary oncology team of the future. This includes the education of veterinary students, veterinary technology students, and veterinary medical residents. Residents are graduate veterinarians pursuing specialized training within a discipline in order to achieve specialty board certification. Currently, four veterinary medical oncology residents and two veterinary radiation oncology residents work in the program. These individuals have already completed a DVM degree, have internship and/or veterinary practice experience, and have a passion for furthering their education in veterinary oncology. The medical oncology and radiation oncology residencies are three-year educational experiences that include mentored work in the clinics, classroom studies combined with a non-thesis masters degree program, seminars and lectures, and special projects relating to veterinary and comparative oncology. 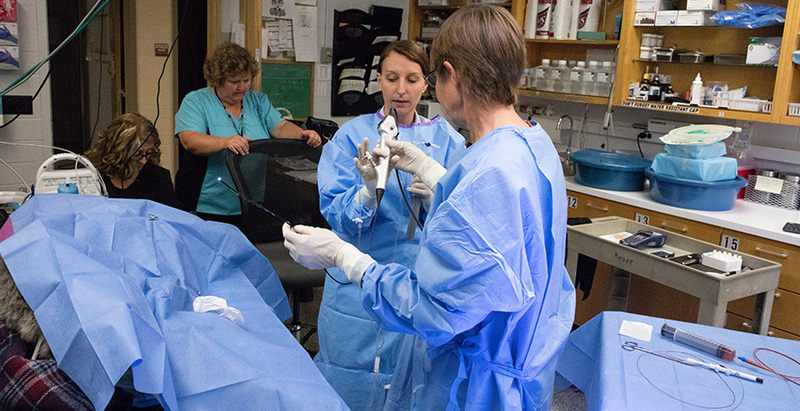 Following completion of the program, residents are expected to meet the eligibility criteria to become board certified veterinary oncologists by the American College of Veterinary Internal Medicine or the American College of Veterinary Radiology. Click here to learn more and apply. Residency program applications are only accepted online through the American Association of Veterinary Clinicians (AAVC) sponsored Veterinary Internship & Residency Matching Program (VIRMP). All program information and agreement, application, and rank forms are available through the VIRMP's web-based system. Please contact Ms. Jesse Mabbitt if you have any questions regarding your residency program application at 765-494-1103.